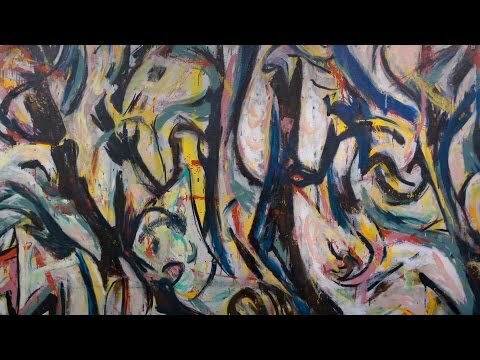 “Jackson Pollock’s ‘Mural’: The Story of a Modern Masterpiece,” a documentary produced by and created at the University of Iowa about the acclaimed painting, has won an Emmy from the Mid-America Chapter of the National Academy of Television Arts and Sciences. Office of Strategic Communication. Jackson Pollock’s Mural: The Story of a Modern Masterpiece, a documentary produced by and created at the University of Iowa, won an Emmy from the Mid-America Chapter of the National Academy of Television Arts and Sciences Saturday, Sept. 9. The film was nominated alongside four others in the “Documentary-Cultural” category. Watch a trailer of the documentary. Kevin Kelley, a creative media producer at the UI for thirty years, produced and directed the documentary. Photo and video producer Kirk Murray served as director of photography, and creative media specialist Dana Telsrow was assistant editor and animator. Ben Hill, senior director for marketing and communications, was the executive producer. Many UI faculty and staff contributed to the project in various capacities and appear in the film as well. The unique project came about in 2014 when Kelley, who has produced several documentaries, proposed a long-form program to tell the story of this now-iconic work. The documentary explores the remarkable journey Pollock’s influential painting took from New York to Iowa and around the world. Featuring well-known and respected art collectors and scholars, the film examines this powerful work and its enigmatic creator, celebrating the timeless energy of a once-controversial painting now hailed as a keystone of modern American art. Mural was gifted to the UI by iconic art collector Peggy Guggenheim and delivered in 1951. It was displaced with the rest of the UI Museum of Art’s collection during the flood of 2008 but continues to be displayed at museums all over the world. The painting underwent a two-year restoration and conservation process starting in 2012 at the Getty Conservation Institute and thereafter has been traveling the world. Since 2014, around 1.5 million people have seen the painting at museums throughout the U.S. and Europe. As of the publication of this story, Mural is in the middle of a three-museum tour across the U.S. The painting is currently on display at Nelson-Atkins Museum of Art in Kansas City until October. The painting will then be displayed at the National Gallery of Art in Washington, D.C., for 11 months starting in November 2017, before closing out its tour at the Columbia Museum of Art in Columbia, South Carolina, starting in November 2018. After that, Mural is likely to return to the University of Iowa where it will eventually take up residence in the new UI Museum of Art, which is expected to be completed in late 2019. The film aired on Iowa Public Television and 22 other public television stations across the region. Learn more about the documentary here. Learn more about UIMA and Mural here.